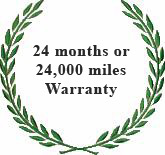 Our warranty last for 24 months or 24,000 miles, whichever comes first. We cover our parts and labor, and your vehicle must be returned to our shop. Some restrictions apply. Warranty 24 months or 24,000 miles which ever comes first. We cover our parts and labor. Some restrictions apply. New tires are covered by manufacturer’s warrants only. Failures caused by the “New Style” fuel not covered. Vehicles used commercially, off road or for facing are not covered. Warranty Valid only if vehicle is returned at customers expense to our service department for adjustment. Warranty will be voided if vehicle overheated or failed from lack of lubrication. We do not cover consequential damage. Warranty only extends to purchaser of the repairs. If customer requests used parts they may have a 30 day maximum warranty. In case of a dispute, customer agrees to binding arbitration. Engine warranties are void if the 15000 mile service is not performed by us. Please call if there are questions. Thank you. Check the warranty on your European car. If you have a BMW, Mercedes, Audi, VW or Volvo that is under warranty and/or a free maintenance plan, one of the best times to make an appointment with Heynneman European is two months before the warranty or plan expires. We may help you catch some problems while there is still time to repair them under the factory warranty. We have found that the manufacturers’ guidelines provide minimal care for a vehicle while it’s under warranty. For example, they may call for oil changes every 15,000 to 18,000 miles. We find that this does not work. As a result we see engines mired in sludge, leading to early engine failure. If you intend to keep your car, we recommend a synthetic oil change every 5,000 miles, or at least once a year, whichever comes first. Owners of under-maintained cars coming out of the free maintenance and/or warranty period may experience a kind of “sticker shock” when they have their car serviced for the first time. They can experience a jump from zero dollars (free) to a couple of thousand — because they need to catch up from having minimal service done to having a program of ongoing maintenance, with quality parts, that a high quality, high performance automobile needs and deserves. At Heynneman European in San Rafael, we are European car repair specialists. We are your foreign car service and repair center for Marin County, San Francisco, and the Bay Area.